Lots of fun fill in Robyn’s latest themeless. There’s a TRACTOR BEAM immobilizing a spaceship. A CASH ADVANCE (watch out for those fees, though). The EMPIRE STATE. A seasonal SKI LODGE and SECRET SANTA. Your TOP TEN HIPSTERS (please, nobody select 10 hipsters, okay?). NOSTRILS! IN THE MIDDLE, GREEN SCREEN, KNOCK OVER, the BATCAVE, and STARGAZER. Really lovely stacks of long answers. ARAL, ENG, ORLY, HRE, IN RE, ACTA, ENE, MST, and RELET are the worst of the fill, but they didn’t ruin the solve for me, they were just dull. 16a. [It resembles an “n” when lowercase], ETA. How did I never know that? Ah, okay, an “n” with a long tail. 5d. [Elephant’s-ear], TARO. Arrowleaf elephant’s ear, apparently, is one variety of the taro plant. 29d. 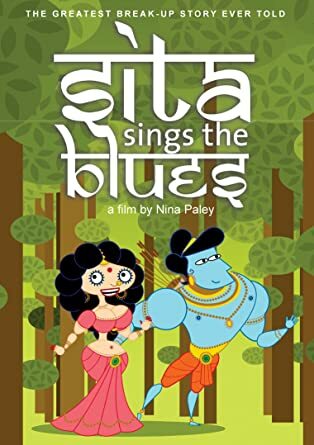 [Rama’s wife, in Hinduism], SITA. I confess I needed the crossings here, and tried SIVA. If you’re as unknowledgeable as I, read up. Four stars from me, with dyspepsia over 27d. Happy Friday, everyone! 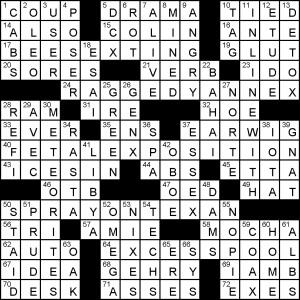 Today’s crossword puzzle, brought to us by Mr. Randall J. Harman, features four multiple-word entries in which the first word, when standing alone, could also come before the word “bee” to form a different phrase/noun. HONEY BADGER (48A: [Ratel]) Bonus “sports…smarter” nugget: Nickname of current Arizona Cardinals safety and 2015 All-Pro Tyrann Mathieu. No hiccups in solving the grid, which is odd since I’m pretty much prone to that occasional mishap that costs me some time. Had a few long entries outside of the theme answers as fill, but none really stood out from that pack. What did stand out was the clue to REAR, as I did have someone who’s involved in the mixed martial arts community offer to put me in that headlock to see how that feels (50D: [____ naked choke (hold that might elicit a tapout]). As you might have guessed, I respectfully declined. There’s probably a good chance that I will hear a SADE song before the end of the day now that I came across her in this grid today (19A: ‘Smooth Operator” singer]). A good number of times, that actually happens not too long after having a song/singer in mind because of doing a crossword puzzle. I’ll keep you updated if that actually happens today. “Sports will make you smarter” moment of the day: EWING (33D: [NBA Hall of Famer Patrick]) – Speaking of coming across something not too long after – or before – doing a crossword, I spent last night watching a classic Christmas Day basketball game from 1994 between the New York Knicks and Chicago Bulls, a game that featured longtime New York Knick center Patrick EWING. Or, as his name is stated in this Snickers ad, Patrick Chewing. Gotta love exploding backboards. Today features a well-made version of a common Friday LA Times theme trope – add letters. Today features “EX”. The EX appears in different words and in different positions of the word, which is less consistent, but in this case leads to pleasant surprises. The answers are interesting, both in original, and altered forms. The themers are: BEES(EX)TING, RAGGEDYANN(EX), FETAL(EX)POSITION), SPRAYONT(EX)AN, (EX)CESSPOOL. There is a revealer in the bottom-right, the vanilla EXES; it seems unnecessary. Favourite moments: [Clickbait site, as of Sep. 2016], OED the rare clueing masterstroke that rescues a terrible answer! And [Fabled lost mittens punishment] for NOPIE. This entry was posted in Daily Puzzles and tagged David Alfred Bywaters, Robyn Weintraub. Bookmark the permalink. Bravo, Amy. School choice, my eye. Same as saying segregation was separate but equal, or scabs are fighting for the “right to work.” Is Will a right wing ideologue? Not to mention that a PAC she founded owes the state of Ohio $5.3 million in fines for past campaign misdeeds. Turning to the crossword itself, I had a really tough time with the NW. I finally got CASH ADVANCE and it was OK after that. It felt like a Saturday. Maybe it was the absence of any sports-related entries. Still, a challenging, excellent puzzle. Interesting. The NW was by far the easiest region for me, perhaps because I used to watch Star Trek and live in NY. Hardest was the NE and mid East. I don’t get the “man bun” clues at all. I loved the puzzle and would have rated it five stars but for the seriously offensive clue for Betsy. It really upset me. WSJ link times out. The cruciverb.com link doesn’t lead to a puz file, either. Same here, so I went to the WSJ site and printed out the pdf. Glad I did – the meta’s quick and fun. Nobody despises that rotten no good excuse for a human as I. But it’s time to face the real world and a real America. He’s soon to be president. That the clues for BETSY or ERIC upset you shows the same kind of ridiculous bias that Trump has. Intolerance for anything that you find offensive when it’s not. The clues are up to date and reflect the reality of what is and not what you wish it were. I would assume that cluing TRUMP as President elect would drive you right over the edge into an infantile leftist la la land where the fill word OBAMA makes you smile, regardless of drone strikes and the killing of innocents. The problem is whitewashing DeVos as a mere “school choice advocate,” in the blandest possible language. That’s a political statement there, because “school choice” is a buzzword that obscures what’s really being advocated. [DeVos who is Trump’s pick for Secretary of Education] would be a neutral, factual clue that doesn’t further an agenda. It’s also inattentive editing to clue ERIC twice in the same week via Trump. It would also be lazy to clue it as, say, football’s Dickerson or actor Roberts twice in one week. Opting for ERIC Trump twice last week and then the buzzword clue for BETSY today suggests the puzzle’s editor may be pushing a political agenda. 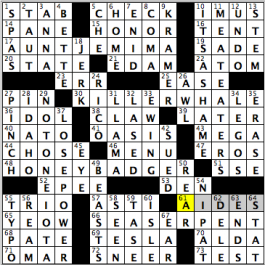 I don’t at all know what Will Shortz’s political views are, but the puzzle is beginning to look ever so slightly like a mouthpiece for a particular movement. It’s concerning, and something to keep our eye on. I do hope that Will will balance things out, and I suspect that he will because he loves the puzzle. I often disagree with you regarding what I perceive as a too liberal version of what life should be like even though I am decidedly left of center. However, I think that this particular post is a very cogent and forceful statement. I nominate RAMIE. Worst clue, agreed, is the vaguely normalizing 27d. No CHE for me to write about today, so I’ll toss in some contributions (read: links) to this puzzle. update: I’m going to take credit for more than doubling the number of views for the Fay Lovsky track. 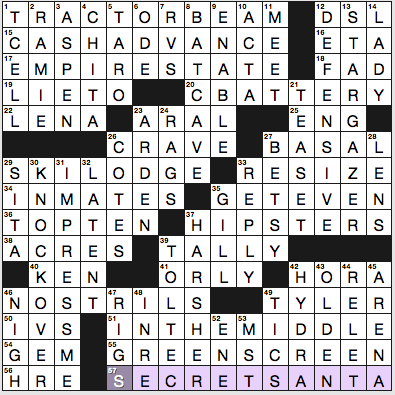 Not sure what it is–besides difficulty–that makes a puzzle fun or not-fun, but I had a wonderful time solving the NYT. The intersection of HYDRA and TYLER was especially pleasing. Seeing a hydra (the microbe version) under a microscope when I was eight or nine years old remains one of the most vivid memories of my childhood. You could try to imagine them as coiffured bánh mì. If you go back and look at puzzles from the Farrar era, they were more topical than the ones we see now. They were kind of a current events quiz. The change I think is largely because of the lag from submission to publication, but it might also reflect the polarization in our country. If members of the freak show have to be included, maybe clue them in a more Jon Stewart-ish way. Something like Iraq:Qusay::USA:__ (Eric) maybe? Now to the NYT puzzle which I just finished. I am with Bruce, NE the hardest and don’t get the “man bun” clues either, which does not surprise me. Man buns are a pony tail kind of hair style, but the “tail” can protrude from any area of the head, not just above the nape. Apparently it’s a favorite among HIPSTERS, young people who are hip to the latest styles, yet are a not part of the cultural mainstream. You’re missing the critique. It isn’t mere inclusion.